Gigavac’s GV Series contactors meet the demand from customers looking for a sealed solution that can handle switching sizeable DC loads. With voltage ratings from 12 V d.c. to 1200 V d.c., the contactors are rated to switch loads in excess of 400 A and interrupt short circuit currents to 3500 A (voltage dependent). 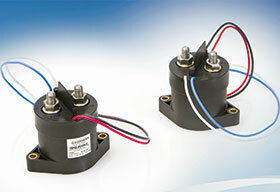 Like all Gigavac advanced switching solutions, these contactors can be mounted in any axis or orientation and are sealed to withstand virtually any harsh environment. All GV Series power contactors meet RoHS and CE conformance requirements. The Gigavac line of EPIC sealed contactors includes GX industrial contactors and MX mil-grade / heavy-duty contactors, in addition to the HV line of relays rated from 1,5 kV up to 70 kV.